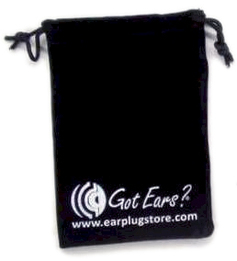 Got Ears?® Small Earphone Storage Bag is the ideal accessory to keep your isolation earphones, earbuds, cell headset and accessories protected and readily at hand. The Bag is approximately 4" x 5", made of black velour material and features the Got Ears? imprint in white, with a drawstring closure.